The campaign that was fought in Africa during WW1 has been largely overshadowed by every other theatre but was extremely significant in the lessons that were (or were not) learned, the operational doctrine developed and the new paradigm that it left the Africans involved. 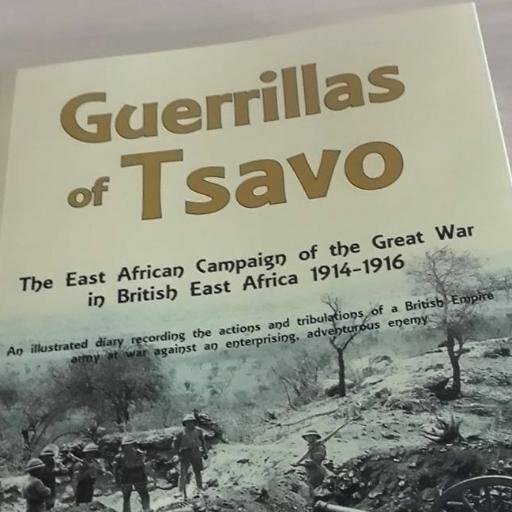 Wilson, a local Kenyan businessman and historian, has become an expert on the Tsavo region and the fighting that took place there and his passion and deep knowledge of what transpired patently evident in this book. It is important to realize that for the major combatants, Britain and Germany, Africa represented very different fields of effort. The one area of common ground was that neither side envisioned Africa being anything more than a brief sideshow to the major efforts on the Western Front: Germany seeing no way of defending/supporting its colonies given the strength of the Royal Navy and Britain simply assuming that the German colonies would capitulate given their isolation. It is interesting that the civilian leadership in both locations preferred to avoid any form of conflict altogether, and it was the military contingents that drove the recruitment, planning and execution of operations. Notwithstanding geography, Africa was unique in the fact that, in no other theatre was the influence of a single commander more keenly felt. In this case, Gen Paul von Lettow-Vorbeck, commanding the German forces throughout the campaign, developed doctrine and an operational appreciation that effectively prevented the vastly superior Allied forces from ever assuming the initiative. Lettow-Vorbeck correctly determined that his Centre of Gravity/Effort was the tying down of as many Allied forces as possible, thereby preventing them from being utilized elsewhere. In this approach, he was successful beyond anyone’s wildest estimations. German forces at their peak numbered 3,007 European Officers and 12,100 Askari (locally trained soldiers) as well as several thousand carriers/porters. Conversely, Allied forces (British, Portuguese and Belgian) numbered in the region of 137 generals, over 300,000 soldiers and many hundreds of thousands of porters. The scope of success of the German effort in Africa may be recognized by the fact that they did not surrender until a week following the armistice in Europe and when they did, it was as an undefeated, still operationally effective force. Wilson has authored a very interesting book. He provides an analysis of the social and political situation in Africa at the time of the commencement of hostilities and also provides the reader with detailed maps and geographic information. He then follows the campaign in a daily format tracing the activities of both contingents throughout the 1914, 15 and 16 campaigning season. As he does so, he emphasizes different doctrines and methodologies used by each side and to what degree they were effective. This is especially telling as the German asymmetric approach, while unique at the time, will be seen as very familiar to subsequent armies and campaigners. The lessons that Lettow-Vorbeck taught in his approach to warfare were decades ahead of his time but they have not been studied by modern military scholars and as a result, remain largely forgotten. They form, however, the basis for most subsequent asymmetric conflicts. This is a well-researched and engaging book. I would strongly recommend that it be reviewed and studied by any student of military history wishing to understand how the correct application of limited force can have far-reaching consequences. Reviewed by Chris Buckham for War History Online.